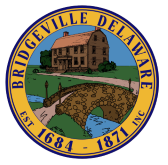 Ordinance 17-1 Vacant buildings & dwelling units registration w/in Town of Bridgeville. Ordinance 17-4 Annexation of 22,297 sq. ft – Ghulam Dastgir, L.L.C. Ordinance 18-4 Amend Chapter 1, Section 1-16; Adding a New Chapter 110 Business Licenses. Resolution 17-1 Demolition of 410-412 Market St. Resolution 17-9 Authorizing the Town Manager to Petition Sussex County to Establish a Sanitary Sewer District and to Enter into a Contract for the County to Operate the Bridgeville Sewerage System.